IPJ director Magda Abu-Fadil (center front row) with participants from Morocco, Algeria, Lebanon, Britain, and the IFJ at the Rabat conference. Round table discussion about media laws and their application to public broadcasting in the Arab Mediterranean region. Opening session of the public broadcasting service conference. Journalists from the Maghreb region, the Middle East and Europe met in Rabat to discuss the merits of public broadcasting and its eventual adoption in Morocco and the Arab World, where most countries’ broadcast media are still state-run. 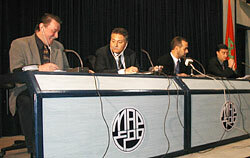 The conference, entitled “Towards Public Broadcasting in Morocco and in the Region” and organized by the Brussels-based International Federation of Journalists and Syndicat National de la Presse Marocaine, adopted a declaration on the creation of an independent public broadcasting system in the region, including an action plan for journalists’ organizations. Morocco is currently introducing new legislation aimed at liberalizing the broadcast sector and creating a broadcasting regulatory body. The official decision by the government to put an end to the state broadcasting system is an important step towards the development of public broadcasting in the country and the Northern Africa/Arab region. 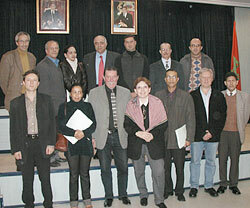 The meeting December 16-17, 2003, which was held at the Agence Maghreb Arabe Presse in Rabat, grouped journalists, academics, members of NGOs and other media specialsts who examined different countries’ media laws, professional associations and obstacles faced by journalists. Participants spoke of a regulatory framework in Morocco, with creation of a Broadcasting Council, and detailed the country’s media and broadcast laws. European experts familiar with the makeup of the European Broadcast Union said public broadcast service was a guarantee of pluralism and cultural diversity in the Mediterranean. Panelists included Magda Abu-Fadil, director of LAU’s Institute for Professional Journalists, who spoke about Lebanon’s broadcast media laws and underlined the need for professional ethics, ongoing training and the understanding of media convergence. They adopted an action plan and released a declaration on the creation of an independent public broadcasting system in the region. The conference was a practical example of transition to public broadcasting in the region, as enunciated in several previous international meetings such as the UNESCO conference of Sana’a in 1996 and a gathering in Amman, Jordan in 2003.